Summary: Concussion, also known as mild traumatic brain injury (TBI) is a common injury. The classic history is a direct blow to the head, neck, face, or to anywhere in the body that imparts an impulse injury to the head. 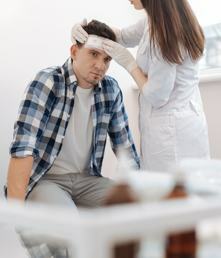 Complications include post-concussion syndrome (PCS) in a small number of individuals, and can leave patients struggling with their symptoms for prolonged periods of time. Primary care providers play a key role in ongoing management of mild TBI. Concussion may be caused by an impact to the head, face, neck or elsewhere on the body with an ‘‘impulsive’ force transmitted to the head. Rapid onset with short-lived impairment of neurological function that resolves spontaneously. May or may not involve loss of consciousness. Largely reflect a functional disturbance rather than a structural injury and, as such, no abnormality is seen on standard structural neuroimaging studies. Resolution of the clinical and cognitive symptoms typically follows a sequential course. In some cases symptoms may be prolonged. 1 in 220 pediatric emergency visits were for concussion (Zemek et al., 2013). The brain releases excitatory neurotransmitters, as well as potassium. Metabolic activity in the brain increases to remove excess transmitters and maintain normal extracellular K+ levels. This results in an increased need for glucose, the fuel of the brain, however blood supply and glucose are not able to keep pace with the increase in demand, and thereby an increase in lactic acid production is seen (Gizza et al., 2001). Increased acid production and increased glucose need require an increased blood supply; however this is not possible due to the brain’s inherent edema following injury. Blood flow can be reduced by as much as 50%, while at the same time cellular needs are higher. This leads to a fragile state where cells are more likely to die, or due to poor energy supply relative to demand, produce poor connections and poor healing (Gizza et al., 2001). While in an injured state, the brain is subsequently less able to sustain a second injury during this vulnerable period without an increased risk of long term sequelae, and even more so than when compared to two isolated injuries (Gizza et al., 2001). Patients presenting with a history of direct blow to the head, neck, face, or to anywhere in the body imparting an impulse injury to the head should be evaluated and observed for symptoms of mild TBI. GCS remains 13 and above at assessment 30 min post injury/concussion. Post traumatic amnesia is resolved within 24 hours, and the patient has regained continuous memory. There is no universal grading system of severity of mild TBI, however many consider the duration of post traumatic amnesia (PTA) to be the best indicator of severity (Cantu, 2011). Probe for additional details such as when, how, the course of recovery, and how the patient was treated. Request previous medical records for verification. Consider the Westmead Post-Traumatic Amnesia Scale (WPTAS), which is a simple test, taking less than 1 minute in the acute setting and correlated with more detailed neuropsychologic testing. In what town/suburb are you in? Any incorrect response is considered a positive test for cognitive impairment after head injury, and thus warrants further investigation. Diagnosis of mild TBI can be challenging as symptoms of concussion can also be seen amongst general trauma patients who have had no head injury and there are no objective tests to confirm diagnosis (Willer et al., 2006). History of previous brain injuries, or a history of substance abuse, may make patients more prone to symptoms of mild TBI (Willer et al., 2006). The diagnosis of concussion is primarily clinical (Marshall et al., 2015). The initial approach to a patient with a head injury or a change in cognition must be to rule out dangerous or life threatening conditions. One such approach is the Canada Head CT rules (Stiell et al., 2001). In short this decision rule consists of 5 high-risk factors and 2 medium-risk factors that aid the clinician towards making evidence based prediction for which patients to image using CT for clinically important brain injury. Practitioners should remain mindful of potential contributing factors to an impaired recovery, such as lack of sleep (Marshall et al., 2012). A person who sustains an mild TBI should not drive for at least 24 hours and may require medical re-assessment prior to resuming driving (Marshall et al., 2012). Symptomatic patients can be followed every 2 to 4 weeks until symptom resolution or until another treatment plan has been implemented (Marshall et al., 2012). It is not abnormal for patients to experience 1 or more persistent symptoms as a consequence of their mild TBI for a short period (Marshall et al., 2012). Minor problems and symptoms should be managed appropriately in addition to providing education and reassurance to patients that that a full recovery of symptoms is seen in the majority of cases. Recovery, for most, is anticipated within days to a few weeks (Marshall et al., 2012). Consider the risk of depression or other mental health disorders in patients who have experienced mild TBI (Marshall et al., 2012). Posttraumatic headache should be tailored to the class of non-traumatic headache it most closely resembles (eg, chronic tension, migraine) (Marshall et al., 2012). Provide sleep hygiene advice and/or relaxation training (Marshall et al., 2012). Pharmacotherapy is generally recommended at the lowest effective dose as short-term treatment, if warranted (Marshall et al., 2012). All patients with persistent symptoms following mild TBI should be screened for mental health symptoms and with appropriate self-report questionnaires where applicable (Marshall et al., 2012). Referral to a psychiatrist or mental health team with experience in the management of mild TBI should be made in the case of complex or severe presentations of mild TBI, or if treatment is not effective within 2 months (Marshall et al., 2012). A selective serotonin reuptake inhibitor is recommended as the first-line drug treatment for mood and anxiety syndromes after mild TBI (Marshall et al., 2012). CBT is appropriate in the treatment of mood symptoms following mild TBI (Marshall et al., 2012). Vestibular rehabilitation therapy (Marshall et al., 2012). Reinforce pacing activities throughout the day(Marshall et al., 2012). Encouraging good sleep hygiene, while reminding patients that quality of sleep is more important than quantity (Marshall et al., 2012). Acknowledge that fatigue can be exacerbated by low mood, and screen and treat mood disorders as needed (Marshall et al., 2012). Concussions are no longer graded. Recovery is recommended to be sequential and focused on functional progression as symptoms clear and do not return with exertion whilst under the careful monitoring of a physician. Implementing a return to work programs (Marshall et al., 2012). Referral to an occupational therapist (OT) with expertise in mild TBI (Marshall et al., 2012). The patient, parents/partners, healthcare providers and work/school/teams should jointly determine what modifications or accommodations are needed, if any (Goulet, 2018). Cognitive (Marshall et al., 2012). One simple and effective tool for measuring mild TBI symptoms is the Rivermead Post Concussion Symptoms Questionnaire (Marshall et al., 2012). Bearing in mind symptoms can be similar to, and possibly have overlap with other conditions such as depression, chronic pain, anxiety and other medical or psychiatric disorders, that anyone with symptoms persisting longer than 1 month should be considered for specialized assessment (Marshall et al., 2012). Definition: Constellation of non-specific subjective symptoms that can be found in a small number of individuals following an initial mild TBI (Marshall et al., 2012). One of the diagnostic dilemmas of PCS, is that there is no one universal definition nor diagnostic criteria; rather PCS is a cluster of symptoms that can occur with a multitude of other conditions (Marshall et al., 2015). Those that experience their injury outside of sport are at higher risk of PCS (10-15%) (Marshall et al., 2015). It has been suggested that even a single psychoeducational session is a key factor in preventing or shortening PCS. In these sessions patients should be provided supportive reassurance, and be educated about the symptoms of concussion. The course of their expected recovery should be outlines and an emphasis on the appropriate attribution of symptoms to benign etiologies should be introduced. Patients should be explained that the gradual resumption of activities can be very helpful and effective in reducing their symptoms (Kempe., 2013,Waldron-Perrine et al., 2015,Goulet, 2018) . Depression can have a profound negative impact on mild TBI recovery and has been demonstrated by many authors to worsen outcome and prognosis in those who sustain mild TBI. For most, all symptoms of mild TBI will be resolved within 1 month (Marshall et al., 2012). Of the few that experience prolonged symptoms there are certain more common characteristics. Those who suffer a mild TBI participating in sport are more likely to make a timely recovery and only 1-3% are expected to experience persistent symptoms (Marshall et al., 2015). It has been found that early, reassuring educational information is beneficial after mild TBI, and can have a positive impact on recovery and reduce symptom persistence. Authors have in fact noted that the terminology used by clinicians can impact the recovery of patients with concussions (Goulet, 2018). Evidence shows the amount of exposure to contact sport is related to the risk of mild TBI. A 2017 paper correlates an increase in ice hockey participation with an increase in concussion risk (Blake et al., 2017). Provides information, education, advocacy, community resources and support to brain injured persons and their families. Stiell IG, et al. The Canadian CT Head Rule for Patients with Minor Head Injury. Lancet 2001;357:1391-96. Blake T, MacDonald K, Palacios-Derflingher L, Emery C. TRAINING VOLUME AND CONCUSSION RISK IN MALE YOUTH ICE HOCKEY PLAYERS: A PRIMARY PREVENTION PERSPECTIVE. Br J Sports Med. 2017 Feb 1;51(4):299-299. Schneider DK, Grandhi RK, Bansal P, Kuntz GE, Webster KE, Logan K, Foss KD, Myer GD. Current state of concussion prevention strategies: a systematic review and meta-analysis of prospective, controlled studies. Br J Sports Med. 2016 Jun 1:bjsports-2015. Cantu RC. Posttraumatic retrograde and anterograde amnesia: pathophysiology and implications in grading and safe return to play. Journal of athletic training. 2001 Jul;36(3):244. Giza CC, Hovda DA. The neurometabolic cascade of concussion. Journal of athletic training. 2001 Jul;36(3):228. Goulet, K., personal communication, 2018. Hazrati LN, Tartaglia MC, Diamandis P, Davis KD, Green RE, Wennberg R, Wong JC, Ezerins L, Tator CH. Absence of chronic traumatic encephalopathy in retired football players with multiple concussions and neurological symptomatology. Frontiers in human neuroscience. 2013;7. Hincapié CA, Cassidy JD, Borg J. Nonsurgical interventions after mild traumatic brain injury: a systematic review. Results of the International Collaboration on Mild Traumatic Brain Injury Prognosis. Archives of physical medicine and rehabilitation. 2014 Mar 1;95(3):S257-64. Hiploylee C, Dufort PA, Davis HS, Wennberg RA, Tartaglia MC, Mikulis D, Hazrati LN, Tator CH. Longitudinal study of postconcussion syndrome: not everyone recovers. Journal of neurotrauma. 2017 Apr 15;34(8):1511-23. Kempe CB, Sullivan KA, Edmed SL. The effect of varying diagnostic terminology within patient discharge information on expected mild traumatic brain injury outcome. The Clinical Neuropsychologist. 2013 Jul 1;27(5):762-78. Marshall S, Bayley M, McCullagh S, Velikonja D, Berrigan L. Clinical practice guidelines for mild traumatic brain injury and persistent symptoms. Canadian Family Physician. 2012 Mar 1;58(3):257-67. Marshall S, Bayley M, McCullagh S, Velikonja D, Berrigan L, Ouchterlony D, Weegar K. Updated clinical practice guidelines for concussion/mild traumatic brain injury and persistent symptoms. Brain injury. 2015 May 12;29(6):688-700. Makdissi M, Cantu RC, Johnston KM, McCrory P, Meeuwisse WH. The difficult concussion patient: what is the best approach to investigation and management of persistent (> 10 days) postconcussive symptoms?. Br J Sports Med. 2013 Apr 1;47(5):308-13. McCrory P, Meeuwisse WH, Aubry M, Cantu RC, Dvořák J, Echemendia RJ, Engebretsen L, Johnston K, Kutcher JS, Raftery M, Sills A. Consensus statement on concussion in sport: the 4th International Conference on Concussion in Sport, Zurich, November 2012. Journal of athletic training. 2013 Jul;48(4):554-75. Ryu WH, Feinstein A, Colantonio A, Streiner DL, Dawson DR. Early identification and incidence of mild TBI in Ontario. Canadian Journal of Neurological Sciences. 2009 Jul;36(4):429-35. Stiell IG, Wells GA, Vandemheen K, Clement C, Lesiuk H, Laupacis A, McKnight RD, Verbeek R, Brison R, Cass D, Eisenhauer MA. The Canadian CT Head Rule for patients with minor head injury. The Lancet. 2001 May 5;357(9266):1391-6. Topolovec-Vranic J, Pollmann-Mudryj MA, Ouchterlony D, Klein D, Spence J, Romaschin A, Rhind S, Tien HC, Baker AJ. The value of serum biomarkers in prediction models of outcome after mild traumatic brain injury. Journal of Trauma and Acute Care Surgery. 2011 Nov 1;71(5):S478-86. Waldron-Perrine B, Tree HA, Spencer RJ, Suhr J, Bieliauskas L. Informational literature influences symptom expression following mild head injury: an analog study. Brain injury. 2015 Jul 29;29(9):1051-5. Willer B, Leddy JJ. Management of concussion and post-concussion syndrome. Current Treatment Options in Neurology. 2006 Oct 1;8(5):415-26. Zemek RL, Farion KJ, Sampson M, McGahern C. Prognosticators of persistent symptoms following pediatric concussion: a systematic review. JAMA pediatrics. 2013 Mar 1;167(3):259-65. Written by Joel Meredith, Family Medicine Resident, Class of 2017. Reviewed by Mireille St-Jean (Family Physician, CCFP), Michael Cheng (Psychiatrist, FRCP(C)). Special thanks to Kristian Goulet (Concussion Specialist) for content expertise.